Accessites.org, the website honoring web designers that "meticulously and lovingly build artful yet accessible websites", presents the Official Website of Arielle B. Cruz the "Notable Universal Design Award". The website of Arielle Cruz is the second among the Filipino designed website that passed the very high web accessibility standard set by Accessites.org. 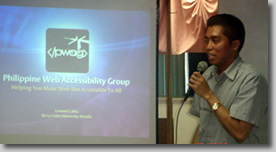 The first one is the Official Website of Philippine Web Accessibility Group. Arielle is PWAG’s Internal Auditor. Visit their complete comments and permanent link of abcruz.com here. The National Computer Center and the Philippine Web Accessibility Group will be giving out for the first time, a special award for the most accessible Web site among the e-LGU entries during the 10th Philippine Web Awards to be staged on November 23 at the Teatrino, Promenade, Greenhills. As a start, the group decides to use the minimum criteria set by PWAG Maturity Stage 1 Checkpoints. The selected judges from PWAG are: Lourdes Borgonia, Lemuel Cabia, Jojo Esposa, Rey Mendoza and Ma’am Grace Amberong. A whole-day seminar on Digital Accessible Information System or DAISY was held at the Manila Hotel last September 5, 2007. The seminar introduces DAISY standards and Digital Talking Books (DTB). Mr. Hiroshi Kawamura, Chairman DAISY Consortium and Project Manager for Daisy for All was the main speaker. Mr. Monthian Buntan, President – Thailand Association of the Blind also gave a demonstration. A traditional talking book is an analog representation of a print publication. A Digital Talking Book (DTB) is a multimedia representation of a print publication. In both instances the rendering of the audio is in human voice. This is very useful specially to the visually impaired and with learning disabilities. Among those who presented include: NCDA Executive Director Atty. Dulfie Tobias-Shalim, Ms. Lanie Arminio, Information Systems Analyst – NCC and PWAG member and Ms. Rebecca Arabain, Supervisor, PPHB-Department of Education. A group of librarians also attended. NCDA was also represented by Mr. Dandy Victa and Ma’am Nelia De Jesus while Ma’am Eva Neri and Grace Amberong heads the NCC group. PWAG was represented by Jojo Esposa. The activity was spearheaded by Resources for the Blind through Mr. Randy W. Weisser Executive Director and Ms. Mayette Regala. PWAG attended the formal launching of www.withnews.org, Internet News for the Disabled and the Poor, last August 28, 2007at Max’s Restaurant, Quezon Memorial Circle, Quezon City. Its chairman, Dr. Hong Sung Wook gave the inspirational message. Mr. Choi, Eun Young is the Executive Director and Dr. Jose PM Cunanan is the Editor. Withnews.org is a joint project of Withnews Philippines and Center for Asian Mission for the Poor (CAMP). Withnews is the internet media which preaches the Gospel and Love of God. It was established in Korea in 2002, and makes a hard effort to establish the rights of the minority and the disabled, for them to live together with non- handicapped people. PWAG was represented by Mr. Jojo Esposa and another deaf member Glenn Ortega. The book “Basic Web Accessibility Guide for Filipinos” was also introduced to the audience who are mostly from the Persons with Disabilities sector. As an offshoot of the successful staging of Baguio City Workshop on Accessible ICT held last February, focal persons for Persons with Disabilities of the Department of Social Welfare and Development in Region 1 held an “E-Accessibility Forum” last July 20 at Zigzag Hotel, San Fernando City, La Union. 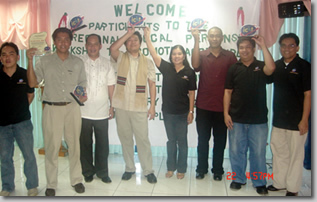 The activity coincides with the Philippine celebration of National Disability Prevention and Rehabilitation Week (July 19 – 23, 2007). PWAG Board Member and NCDA Assistant TCC Chief Dandy Victa was the special guest speaker. He emphasized on the ICT tools and facilities that can now be used by the disabled persons. NCDA particularly the Philippine Web Accessibility Group are enforcing and encouraging LGUs, NGOs and government associations to add accessibility features in their websites. The forum was attended by government web designers, provincial DSWD representatives and other government and non-government organizations. Also in this event, the book “Basic Web Accessibility Guide for Filipinos” was launched. Many participants are interested to buy copies of the book. Region 1 was the first group from Baguio workshop that implemented their commitments for accessible ICT. Ms. Virginia T. Sessay, Region 1 Focal Person for PWD spearheaded the activity. A plaque of recognition was given to her by PWAG and NCDA. Continue reading DSWD Region 1 Press Release. Book cover page with Philippine flag, PWAG logo, disability symbols in black background. The 102 page book “Web Accessibility Guide for Filipinos” is now officially published and copyrighted. This is one of the crowning achievements of PWAG. Some of the articles there are in the PWAG website and Yahoogroup but most of the contents are new. 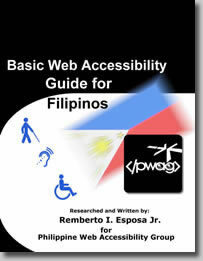 The book contains definition of web accessibility, types of assistive devices available, laws affecting disability in the Philippines, statistics of Filipino PWDs and Filipino Internet user statistics. It also details the history of web accessibility initiatives in the Philippines from 2003 up to the present. The book also lists down the basic manual accessibility checklist and detailed description on how to comply with Manila ICT Design Recommendations as well as PWAG Maturity Stages 1 and 2. It also features accessible websites from House of Representatives, Dela Salle University, Arielle Cruz Website, Manila Christian Computer Institute for the Deaf, Vision Office, National Council on Disability Affairs and Emilio Aguinaldo Colleges. The book is sold for P250 each. Proceeds will go to PWAG funds. Special thanks to MCCID for shouldering the printing expenses. For details on how to buy this book, please email us info@pwag.org or call us at Tel. Nos. 02412-9447. The book will soon be available in National Bookstore. 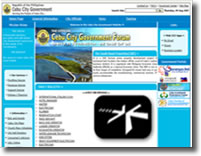 PWAG Evaluating Team has certified accessible the Official Website of Cebu City Government. 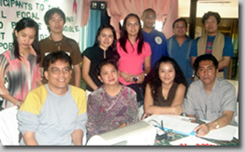 Cebu City web development team headed by Engr. Conrado A. Ordesta III – MICS Asst. Department Head renovated their website to conform with PWAG’s Web Design Accessibility Recommendations Maturity Stage 1. Sir Tads was one of the officials who organized the Philippine Webmasters’ Interface on Accessible ICT for PWD held at Mango Park Hotel, Cebu City from May 16 – 18, 2006. By designing an accessible site, Cebu City Government is now an official institutional member of Philippine Web Accessibility Group. Congratulations Sir Tads and welcome to PWAG family! Regular ICT Sub-committee Meeting was held at the residence of it’s chairman, Sir Noli Agcaoili of Nova Foundation. Those who attended include a representative from Technical Education and Skills Development Authority (TESDA), Sir Lauro Purcil from Special Education Division of Department of Education, Capt. Oscar Taleon of Akap-Pinoy, Ms. Nelia De Jesus and Rene Angat of NCDA and Jojo Esposa of PWAG. Agenda of the meeting includes the Creation of Online Registry for Persons with Disabilities in the Philippines and offering free medical transcriptions and call center training for visually and orthopedically challenged persons through TESDA’s PGMA Scholarship Program. PWAG for its part, presented its accomplishments from January to May of this year as well as other future plan of activities. PWAG is the newest member of NCDA’s Sub-committee on Information and Communications Technology. “Magna Carta for Disabled Persons and for other Purposes” was signed into law by President Gloria Macapagal-Arroyo last April 30, 2007. Highlight of the amendments is the treatment of disabled persons similar to senior citizens. A PWD can now be entitled of:20% discount from all establishments like hotels, restaurants, etc. ; 20% discount on admission fees charged by theaters, concert halls, amusements, etc. ; 20% discount for purchase of medicines in all drugstores; 20% discount on medical and dental services; 20% discount on fare for domestic air and sea travel; 20% discount in public railways, bus, etc. ; educational assistance through scholarships, books, etc. ; discounts in special purchases; provision of express lanes in all commercial and govt. establishments; and additional tax incentives. Another important provision in the Amendment is the act of making fun, mockery and contemptuous imitating them (public ridicule) due to their impairments. These also include slanderous, abusive statements and inciting hatred. Penalty for these violations are: P50,000 or imprisonment of six months – 1st offense; P100,000 or imprisonment of six years – subsequent violations. Read the complete RA 9442 law here. PWAG Evaluating Team has certified accessible Blinding-light.com web site. Designer Miko Reznor renovated her web site to conform with PWAG’s Web Design Accessibility Recommendations. Blinding-light.com offers free web layouts, Photoshop brushes, a variety of graphics and coding tutorials. By designing an accessible site, Miko is now an official member and the first under the newly registered Philippine Web Accessibility Group. Congratulations Miko and welcome to PWAG family! Another great news for PWAG!!! Infotech Support Provider, Inc., a premier Information Technology Outsourcing company which is based in Metro Manila, gave Philippine Web Accessibility Group free 500 megabytes of webhosting for two years. Based on the company’s rate of Php500/month, that’s Php12,000 (US$260) savings for PWAG! This donation was quietly given to PWAG by its co-owner and newly invited PWAG e-group member Kernan Butalid Motoomull. In his personal email, Kernan said "We want to keep this private and we do not intend to get anything in return (no link exchange or any promotions). This is our way to give something back to the community especially to our impaired brothers and sisters." However, PWAG core team decides to announce the gift to everyone as our way of expressing our appreciation. Techsupport.ph provides cost effective Information Technology (I.T.) products and services to small and medium-sized businesses (SMEs). Aside from that, Kernan is also the Enterprise Applications Manager of www.asp.com.ph and Co-owner of www.1pesohosting.com, another webhosting company. In behalf of PWAG Board, thank you very much for your donation. Great news for all PWAG members especially web designers and developers!!! TurfSite Computing, Inc., one of the premier webhosting company in the Philippines owned by newly joined PWAG e-group member Robert DC. Reyes, offered 20% discount across all webhosting plans valid for new accounts, renewals and transfers. Aside from that, the company also offers 10% discount on domain name registrations, renewals and transfers of all top-level domains. Reyes also made an additional offer of 35% discount for members who were able to design websites that follow PWAG’s Web Design Accessibility Recommendations. This means a 100MB webspace with 2.0GB bandwidth and unlimited POP3 which is offered at Php1,500/year (US$32.6) will only be offered as Php1,200/year or a Php300 discount! That’s great value for your money. For accessible web designers, that’s Php975/year or a Php525 discount! Bob gave this wonderful offer as his gift to support the group and to entice members to make their websites accessible to everyone. PWAG will be using this offer as one of its perks in joining the group. Simply inform their Sales Department at (+63) 916.320.1513 that you are from PWAG and with proper verification, your discount is automatically deducted from your account. TurfSite Computing, Inc. was established on 08 November 2003.It aims to give top-notch quality webhosting services to the average Filipino. They have evolved from a home-based business to an emerging name in the Internet Presence Provider business in the Philippines. They specialize in RedHat Linux Server website hosting and domain name registration services. The Securities and Exchange Commission (SEC) has approved Philippine Web Accessibility Group, Incorporated as a non-stock, non-profit corporation based on the submitted Articles of Incorporation and By-laws. SEC has issued PWAG a Registration No. CN200707035 and company Tax Identification Number of 006-726-164 given last May 8, 2007. The data appears on the Certificate of Incorporation. 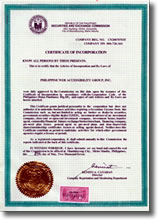 With this certificate, SEC has granted PWAG a judicial personality as a corporation and not just a loose community. Based on it’s approved objectives, PWAG is also allowed by the Philippine government to transact business, receive membership fees, accept donations, endowments, grants, legacies and instruments/devices conformable with existing applicable statutes. Expect more worthwhile activities and an even stronger advocacy campaign to come from the group. The certificate was issued by Mr. Benito A. Cataran, SEC Director for Company Registration and Monitoring Department. Go to the “About Us” link to view our updated objectives. Accessites.org, the website that “showcases and provides awards-recognition for certain websites and designers that shatter the misconception that accessible web sites are boring and basic” wrote an informative article introducing the Philippine Web Accessibility Group. The website features the group’s mission, objectives and recent accomplishments. This is another feather in PWAG’s cap. Being recognized by an international group belonging to the top sites on web accessibility such as Accessites.org is truly an honor and our advocacy to be heard by the rest of the world. Again, thank you very much for this wonderful recognition Team Access! View the complete article link from Accessites.org here. One of the major accessibility concerns of persons with disabilities is the inclusion of closed captions in any video format. Under the PWAG Web Design Accessibility Recommendations, it states that users must provide transcriptions for all audio and video clips. This is very useful especially for the deaf and hard of hearing people. With this in mind, PWAG created demo of digital video files using the three most popular formats; Windows Media Video (.wmv) of Microsoft, Movie File (.mov) of Apple Quicktime and MPEG-4 (.mp4) of RealPlayer. Accessites.org, the website honoring web designers that "meticulously and lovingly build artful yet accessible websites", presents the First Edition Official Website of Philippine Web Accessibility Group the "Notable Universal Design Award". Team Access, the group of well-known web designers/developers that form Accessites led by Mike Cherim commented that "The Philippine Web Accessibility Group site proves to be a solidly built and easily navigable site. Great attention has been paid to making the site accessible with clean markup, a breadcrumb trail and extended image descriptions." Started in 2005, Accessites has been giving recognition to websites that combine both accessibility and artistry. Web designs must pass through their very rigid minimum criteria in order to be evaluated like, among others; the use of table-less layout, valid CSS, passing the WCAG 1.0 Priority 1, functional even with images and CSS are disabled, color contrasts, "Strict" doctype, fluid layout and semantically correct elements, original design and of course it must look great. Visit their complete comments and permanent link of PWAG here. PWAG members participated in the Manila official launching of Adobe Creative Suite 3 last May 4 at Makati Shangrila Hotel. This was part of the group’s aim of learning new technologies to enhance web designing skills and at the same time promote web accessibility. The day-long activity showcased updated versions of Adobe products including the enhanced versions of Adobe Photoshop and the formerly Macromedia, now Adobe Dreamweaver CS3. Among the impressive features were the tight integration of Photoshop with Dreamweaver, improved support for Cascading Style Sheets and the built-in Spry AJAX. Considered the most important achievement for PWAG during that day was the meet up of bloggers and web standards advocates including Mr. Regnard Kreisler C. Raquedan, Group Manager of Adobe User Group Philippines (AUGPHIL) and also a PWAG e-group member. For more on AUGPHIL, visit their site at www.augphil.org. Details on the highlights of the Adobe Group Launching is posted on the stellify.net website of Ms. Ia Lucero. The official website of the Dela Salle University won in the Education Category award during the First DigitalFilipinocom Web Awards. The official website of Philippine Web Accessibility Group was selected as one of the finalist under the Organization/Community Category. The awards was spearheaded by the famous writer, e-commerce advocate and fellow PWAG e-group member, Ms. Jannette Torral. The program aims to advocate the use of Internet and e-Commerce for business development through the identification, promotion and highlighting of best e-Commerce practices from various websites in the Philippines. The winners were awarded last April 27, 2007 at the Penthouse of Board of Investments, Gil Puyat Avenue, Makati City. To know more about the award. Visit the DigitalFilipino.com Awards official website for complete details. After almost seven months since it opened, the Accessibleweb Yahoo E-group members jumped to 72 from 41 last January. New members include almost all of the IT participants in the Baguio City workshop as well as those whom the PWAG members have personally invited. Current members were also encouraged to have their website validated by the group in order for them to become official members. PWAG members was welcomed by Mr. Llanes (center), ATRIEV President. Fresh from the Baguio City gathering, the group again assembled last March 22, Saturday at the conference hall of Adaptive Technology for Rehabilitation, Integration and Empowerment of Visually Impaired (ATRIEV) in Kamias, Quezon City. The venue was courtesy of the generous invitation of ATRIEV president, Sir Antonio D. Llanes Jr. Eight members attended the meeting. They are Lemuel Cabia, Carlo Costales, Arielle Cruz, Rene Orense, Jojo Esposa, Dandy Victa, Lourdes Borgonia and Ma’am Nelia De Jesus. Discussions include the deliberation and signing of Application for Registration under the Securities and Exchange Commission, general assessment of current setup, formation of committees and future plan of activities. The most important part of the activity is the bonding and sharing time among the fellow PWAGgers and advocates of web accessibility in the Philippines. Jojo, Lemuel and Sonny is being interviewed by TV Patrol News Anchor Pia Gutierrez. The Philippine Web Accessibility Group made its first appearance as a community of web designers advocating web accessibility by working as resource persons during the Focal Persons Workshop on Accessible ICT held at Summer Place Hotel in Baguio City from February 19 – 23, 2007. The workshop was attended by 32 regional focal persons and their IT counterpart from the Department of Social Welfare and Development (DSWD). It focuses on the importance of information and communications technology and the removal of barriers making it accessible to everyone including persons with disabilities. On the first day, PWAG members including Ms. Nelia De Jesus of NCDA were interviewed by ABS-CBN News team and other radio stations. A news item was shown in TV Patrol Northern Luzon the following day. Visit this Youtube link to view the TV telecast. The workshop was in partnership with the National Council on Disability Affairs (NCDA), National Computer Center (NCC) and the Department of Social Welfare and Development (DSWD). PWAG core group team formed part of the workshop’s resource persons. Jojo Esposa of MCCID lectured on “What is Accessible ICT?”. Lourdes Borgonia and Rene Orense of ATRIEV explained about the use of screen readers and other assistive technologies. Lemuel Cabia of DLSU introduced PWAG to the group and mentioned about its history, advocacy and future plans. Ervin Reyes of MCCID, clarified the deaf friendliness of computers. Gimar Aguillon, deaf webmaster of Nova Foundation together with Ms. Carol Trinidad proved that disability is not a hindrance in getting the right job. The speakers were divided into two groups; the government sector tagged “e-Gobyerno” led by Ms. Grace Amberong of NCC, Ms. Nelia De Jesus of NCDA and Ms. Marlyn Moral of DSWD and the private sector named “e-Pribado” which is composed of PWAG speakers and other non-government agencies like Ms. Mayette Regala of Resources for the Blind, Mr. Lauro Purcil and Mr. Dandy Victa of Digital Access to Information Systems (DAISY) and Ms. Jonalyn Galamgam of Liliane Foundation. PWAG also held an impromptu hands-on sessions on different access features to make “disabled-friendly” websites for the IT staff. The team including Sonny Villafania of Emilio Aguinaldo Colleges and Arielle Cruz, freelance web developer assisted the workshop attendees during the activity. After almost four months since the last meeting held in MCCID, the group again assembled but this time in a cool, refreshing and welcoming atmosphere of Baguio City last February 22. PWAG members pose during the dinner meeting. The meeting was very special and memorable for the group because this is the first time it was held outside of Metro Manila. It also includes the newest official PWAG members namely, Arielle Cruz, Gimar Aguillon, Raoul Diez and Santiago Villafania. All four of them, including Jerry Abordo of Bureau of Local Employment – Department of Labor and Employment (did not attend the workshop) passed the three out of four criteria in becoming a member. PWAG core members Jojo Esposa, Lemuel Cabia, Ervin Reyes and Lourdes Borgonia together with Rene Orense also participated in the meeting. The group also announced their fifth meeting to be held at the ATRIEV office this coming March upon the invitation of its resident web designer and PWAG core group member, Ms. Lourdes Borgonia. Awardees proudly raised their plaques. The Philippine Web Accessibility Group is very proud to announce the latest batch of recipients of the "Disabled Friendly Web Site Awards". They were presented in front of the regional DSWD regional representatives together with their information technology team during the “Focal Person’s Workshop on Accessible ICT” held at Summer Place Hotel, Baguio City last February 22. The awards were divided into two categories, those who participated in the three regional workshops and those that complied with accessibility through the PWAG initiative. The workshop attendees received two plaques, each for the institution and the web designer/web team. Among those who attended the previous workshops, only the De La Salle University Official Web Site passed the eight point criteria set by the Manila ICT Design Recommendations (Maturity Stage 1). They are the fourth recipient of the awards after the House of Representatives, ATRIEV and MCCID. Mr. Lemuel Cabia, DLSU Senior Web Designer and also a PWAG core group member, received the plaque in behalf of the institution and another one as part of the web development team. All five web sites passed an even stricter validation from PWAG members. Aside from the Manila ICT Design Recommendations (Maturity Stage 1), they also complied with the PWAG Design Recommendations (Maturity Stage 2). Cebu Doctor’s University site was made accessible in 2005. Gimar is the only deaf awardee. Sonny and Jerry decided to make their web sites accessible only after attending the meeting held at NCDA last October. Arielle, also a multimedia artist decided to comply with PWAG recommendations only through the e-group. 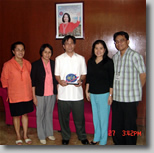 Jerry of BLE-DOLE is flanked by DOLE representative, his wife, Ms. Nel and Jojo. The plaque of recognition was signed by Dir. Timoteo De Rivera of CICT, Mr. Leo Valdes of Vision Office, Sec. Esperanza Cabral of DSWD and Dir. Catalina Fermin of NCDA. Of the five awardees, only Jerry of BLE-DOLE did not attend the ceremonies due to conflicts of schedules. NCDA Representative Ms. Nelia De Jesus together with PWAG’s Jojo Esposa personally gave the plaque to Jerry in his office in Intramuros, Manila last February 27. BLE-DOLE Web Site is the second government site awarded and the first from the executive branch. The House of Representatives Official Web Site belongs to the government’s legislative branch. DSWD Social Technology Bureau Director Finard Cabilao gave out the awards while Ms. Nelia De Jesus of NCDA made a brief explanation on the criteria of selecting the awardees. Jojo Esposa of PWAG also gave a few details how the group was able to comply with the criteria. The whole audience gave the awardees a very warm clap appreciation while some even commented that they hope they can also achieve the same recognition as them. Being recognized in helping persons with disabilities access the Internet without barriers is truly a great honor. The National Council on Disability Affairs’ Official Web Site has been evaluated and certified accessible by the Philippine Web Accessibility Group. NCDA is the government partner agency of PWAG. They have been in the forefront of advocating accessible information and communications technology and promoting assistive devices for persons with disabilities. Together with DSWD, they sponsored regional workshops/trainings on how to make accessible web sites for the past three years. The web site template was developed by the National Computer Center. Congratulations, NCDA!!! Philippine Web Accessibility Group officially announces its Web Design Accessibility Recommendations and Checkpoints. The decision came after months of discussions from among the members of the Accessibleweb Yahoo Group. It also used the existing checkpoint criteria used by National Computer Center Team in evaluating web site compliance of those who attended the three workshops. Some of the inputs also came from the series of meetings held by core group members. The primary basis is still the adoption of the Manila ICT Design Recommendations. The term used in defining the priority checkpoints are Maturity Stage. A Maturity Stage 1 means the web site needs to meet the requirements set by the Manila ICT Design Recommendations A Maturity Stage 2 means the web site should meet the criteria set by PWAG. View the complete list of PWAG Web Design Accessibility Recommendation Checkpoints. Also, view the Comparison Between PWAG Design Accessibility Recommendation with Section 508 of Rehabilitation Act of USA and Web Content Accessibility Guideline 1.0 of World Wide Web Consortium. PWAG has evaluated and certified accessible the personal web site of Mr. Arielle B. Cruz an independent multimedia artist from Pasig City, Philippines. His web site conforms with the minimum web accessibility requirements set by the group. Arielle offers web design, development and maintenance services; multimedia presentation and application development services; and graphic design work at highly competitive rates. Congratulations Arielle! Jojo presents web accessibility to ASEAN delegates in Pune, India. 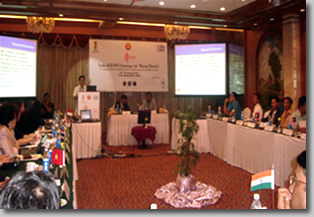 Organizers and delegates of the Indo-ASEAN Seminar on “Shruti Drishti” held at Pune, India from January 18 – 19, 2007 were very much impressed by the presentation and active participation of the Philippine delegation. The Philippines were represented by participants from the government’s Commission on Information and Communications Technology (CICT) led by Ms. Nieva S. Neri, Information Technology Officer of National Computer Center-CICT, Ms. Ms. Maria Leanna Alvero Beltran, Content Development Coordinator of CICT and Mr. Remberto I. Esposa Jr., one of the administrators of Philippine Web Accessibility Group (PWAG) and MCCID Training Director. During the country presentation, Jojo explained in detail about the initiatives made by the Philippine government in helping persons with disabilities access to information technology through the partnership between CICT and the NCDA. He also added about the vigilant participation of the private non-government national organizations like ATRIEV, RBI, PBU and PWAG. It was most applauded by the delegates and interests on it were gauged by the numerous questions raised by the group. Queries range from web accessibility and use of ALT text attributes on images as well as text messaging system in the Philippines which were all answered clearly by Mr. Esposa and the rest of the team. Host delegation led by Mr. Ajai Kumar of India’s Department of Information Technology and other delegates congratulated the Philippine team for its wonderful presentation. Among those who participated include delegates from Cambodia, Laos, Indonesia, Malaysia, Myanmar, the Philippines, Singapore, Thailand, Vietnam and host country India. To download the complete PowerPoint presentation, go to the Accessibleweb Yahoogroup. PWAG has evaluated and recognized the Official Web Site of Cebu Doctors University as accessible to Persons with Disabilities. Raoul R. Diez is its official web designer. Cebu Doctors’ University Web Site has been made accessible and usable since 2005. Visit this post for the NCDA confirmation. Congratulations Raoul! Accomplished professional web developers who adhere to web standards and usability from the Philippines were invited to join the Accessibleweb Yahoo e-group as the list swelled to 41 with 18 new members joined. The names and email addresses of the new recruits were listed on the w3csites.com web site Philippine group. Expect a livelier and a more objective discussion on web accessibility as well as web standards and best practices. Philippine telecommunications giant Globe Telecoms promised to redesign their web site and make it accessible to persons with disablities. Thank you for letting us know of your concern. I am sorry to hear that you were inconvenienced when trying to access our website. I have informed the officer-in-charge for the support group handling the administration of our site, so they may review current process and plan for such enhancements and revisions, a more user-friendly site. Rest assured that we value such feedback, to help us serve you better and provide the best customer experience you deserve.